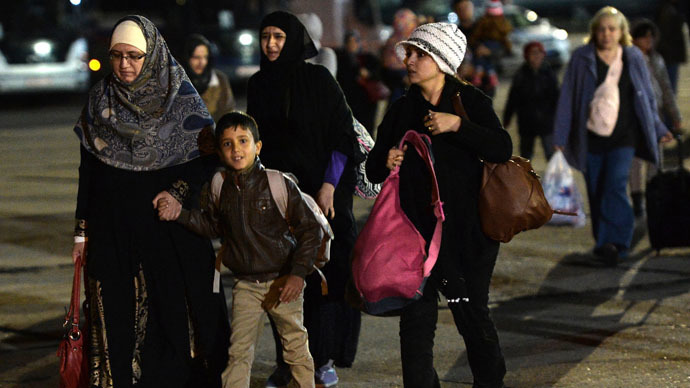 The fifth Russian plane carrying refugees from war-torn Yemen landed in Moscow carrying 150 people from 12 countries. The evacuees described the horrors of constant bombing and praised Russia for organizing the airlift. Citizens of Russia, Uzbekistan, Tajikistan, Ukraine, Belarus, Armenia, France, Germany, Yemen, Kazakhstan, Kyrgyzstan and Iraq were onboard. They cited the ferocity of clashes between Shiite Houthi rebels and forces loyal to the ousted Yemeni President Hadi, supported by Saudi-led bombings, as their sole reason for leaving. Florence Bureau, a French citizen, also found the constant nighttime air raids impossible to bear. Russia was the first country to arrange accessible evacuation. Russian Gulnara Tama left because she feared an airstrike would kill her children. “The worst thing is that you don’t know what the future holds for your kids because they are not receiving any education. Children are stuck at home in fear,” she said. Ukrainian Irina Aldahri, said she had lived in the Yemeni capital, Sanaa, for 30 years and had been forced to leave her life behind. “The airstrikes are very scary to live through that is why [my son and I] decided to leave. Twelve days ago everything quickly deteriorated – daily bombings, all work stopped. We were sitting at home, too afraid to go outside,” she said. Aldahri’s mother, who was visiting her in Sanaa, had already evacuated to Moscow. Their plan is to travel back to Ukraine. “I didn’t want to leave because once the morning came, everything would calm down and the stores would reopen,” she said. Five gulf states and Egypt have launched a week of airstrikes targeting Shia Houthi rebels, who had seized the Yemeni capital and large territories in the west of the country. Jordan, Sudan, Morocco and Pakistan also expressed willingness to join in the military operation. Saudi Arabia took full control of Yemen’s airfields and seaports, allegedly to prevent arms coming in from abroad and intensive airstrikes targeted Houthi stronghold of Saada in the north and the port city of Aden, scene of a running battle. Yemen’s war has killed at least 185 – three-quarters of them civilians – and injured over 1,200, a medical official told AFP on Saturday.